Relax on the beach, enjoy the crystalline waters or explore the tropical surrounds on a relaxing catamaran cruise to Saona Island. White sandy beaches, coconut palms, crystal clear turquoise waters and a special Dominican touch makes for an unforgettable day of relaxation during your Caribbean vacation. A horseback riding tour with a canopy zipline adventure is a great way to take in the gorgeous scenery of Punta Cana! Walk, trot or gallop—depending on your skill and preference—along the Anamuya River. Follow your expert guide to a cigar plantation before arriving back at the ranch for an adrenaline-pumping zipline through the trees. If you upgrade your tour, you’ll enjoy a thrilling cattle drive! After a Dominican feast, tour the plantation where coffee, vanilla and cocoa are grown—with plenty to sample. Round-trip hotel transport is included. Ladies and gentlemen, start your engines! 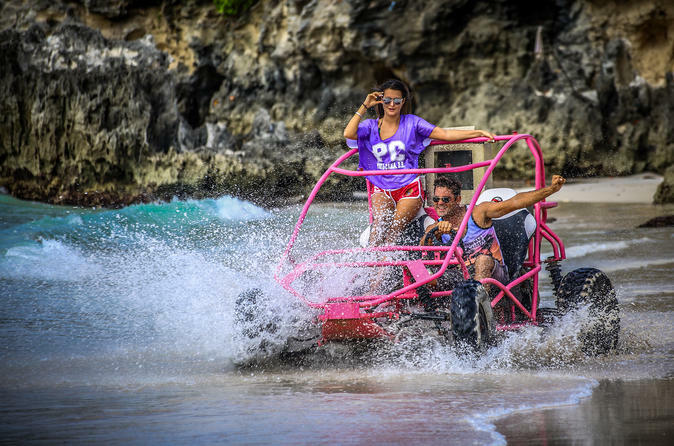 Prepare yourself for a half-day Dominican Republic adventure as you zip through the beautiful countryside on a manual transmission dune buggy. Departing from Punta Cana, you'll travel past colorful houses and across the breathtaking landscape of banana plantations and farmland. 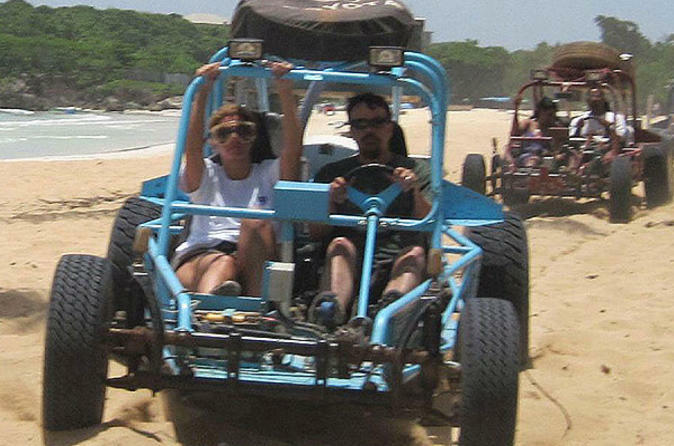 Hop on a dune buggy and explore the true Dominican Republic! 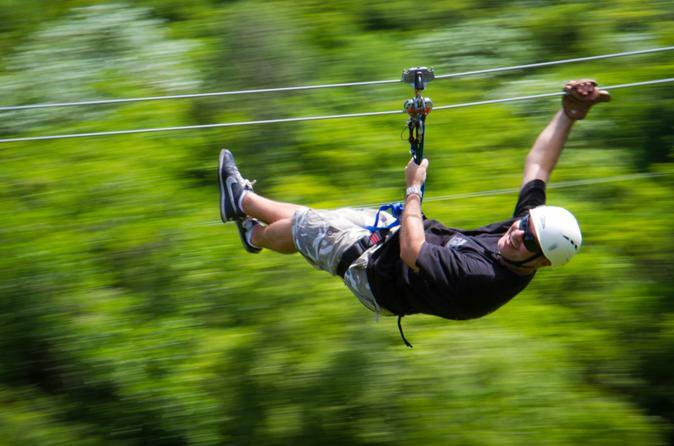 Experience the thrill of four adventures in one with this epic tour from Punta Cana. Relax and spend time aboard a double deck catamaran. Discover wonders of the sea and and enjoy close encounters with marine life. You'll snorkel in a spectacular barrier reef surrounded by tropical fish and experience the fun of an interactive marine show complete with sharks and stingrays. This popular tour option includes unlimited drinks on the best party boat around and is perfect for fun with family and friends. 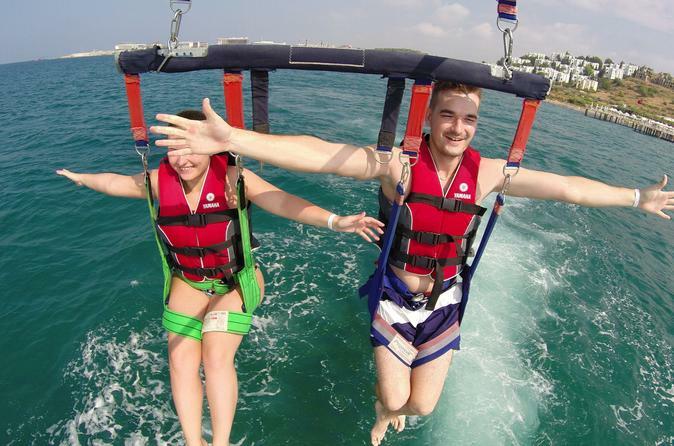 After you get a taste of life underwater, explore it from above with a thrilling parasail 500 feet above the surface of the water! 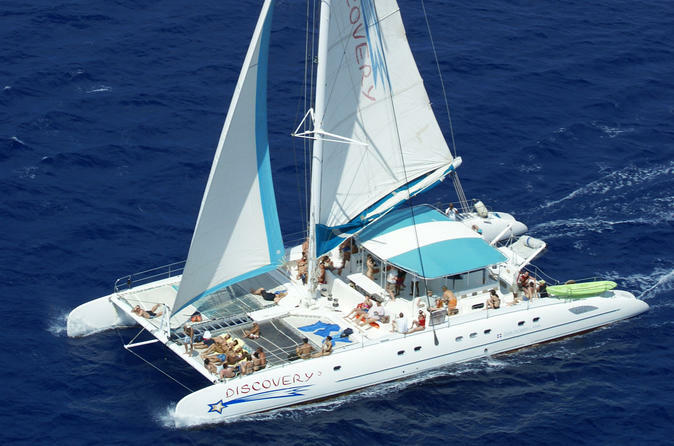 This small-group sailing and snorkeling catamaran tour is limited to 16 guests so you can receive personalized attention. Go swimming in a natural reserve, snorkel in crystal clear water and enjoy drinks and fun on the boat. Cruise on a 34 by 22 foot trimaran that will give you the unique chance of sailing the crystal clear shallow waters of Punta Cana. The boat has four nets to relax on that will be your hammocks while the crew pampers you with cocktails. It also has fully-covered and shaded areas. The boat will anchor in a lovely sand bar with waist deep water to chill out with an exclusive floating bar. 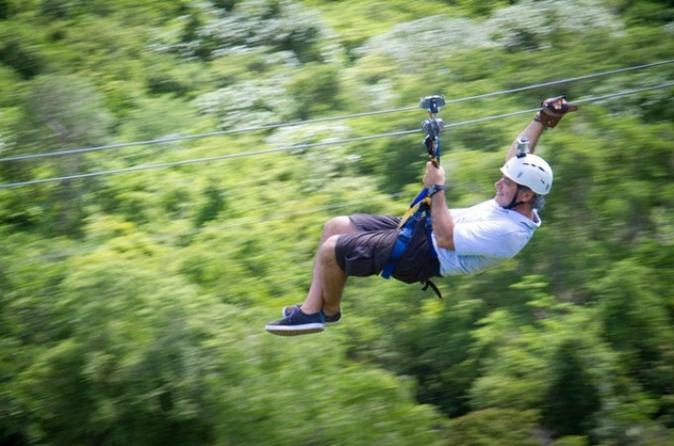 Experience the thrill of a lifetime and hop on the first zipline in the Dominican Republic! 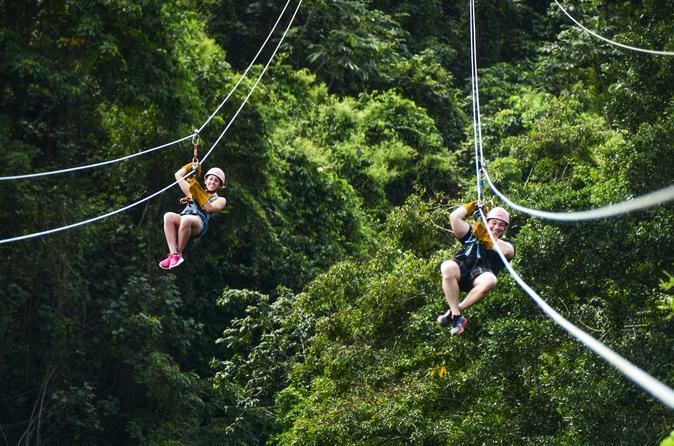 Soar from platform to platform, high above the ground and through the treetops, as you gain spectacular views of the Dominican Republic's rainforest. 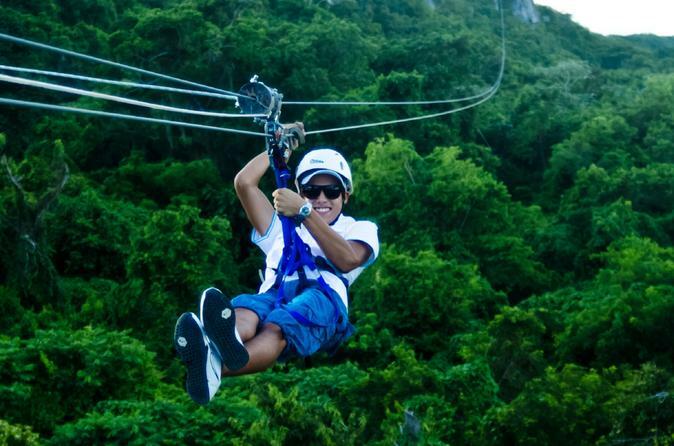 Book your Punta Cana Zipline Canopy Adventure for a day filled with fun, adventure and breathtaking vistas! 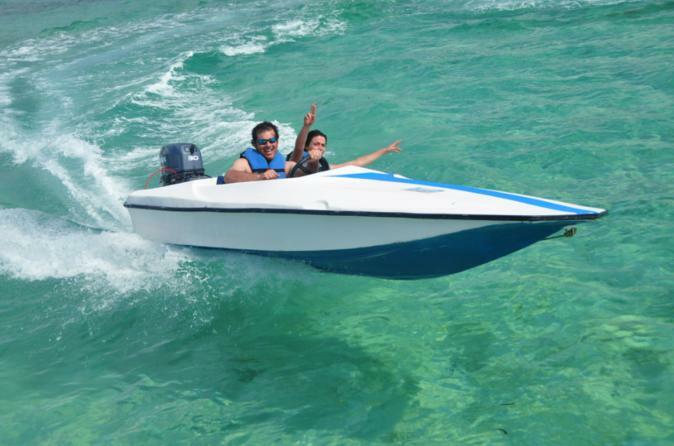 Take to the Caribbean waters off the coast of Punta Cana and enjoy some fun in the sun! You'll sail along the Dominican coastline, enjoy a delicious lunch and open bar and snorkel in the pristine waters Punta Cana is known for. 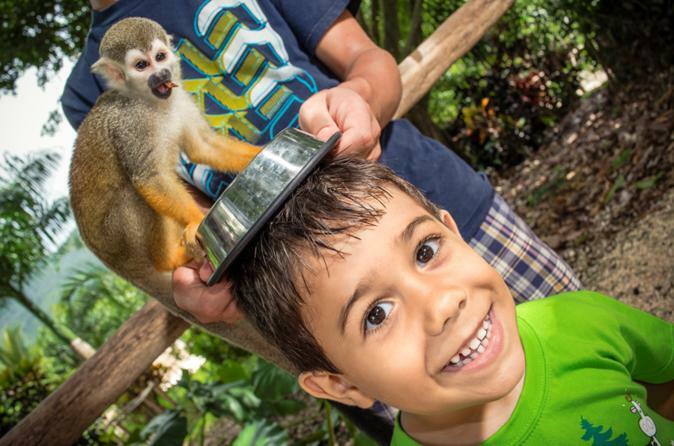 With plenty of onboard entertainment, this family friendly cruise in the Dominican Republic is fun for everyone! Discover the Dominican countryside while driving a powerful all terrain off road Dune Boogie, where you'll go on an exploration adventure you will always remember. As you Boogie through the Dominican jungle, you'll taste naturally harvested chocolate, coffee and cinnamon and visit the beautiful Macao Beach and Amazing Farallon cliff, which offers a picturesque view of the entire coastline. You'll be amazed at nature's ability to create when you dip inside the freshwater springs of vibrant underground caves. Even more exciting is the second part of this package, The double deck party boat Catamaran Cruise. For 3 hours, enjoy the party boat of a lifetime! Fresh snacks, unlimited drinks, music and dancing ensures that you'll enjoy a wonderful time with family and friends. Snorkel the barrier reef's clusters of corals with its distinct undersea wildlife & and discover the most relaxing and magnificent section of water in all of Punta Cana, our famous Natural Swimming Pool. 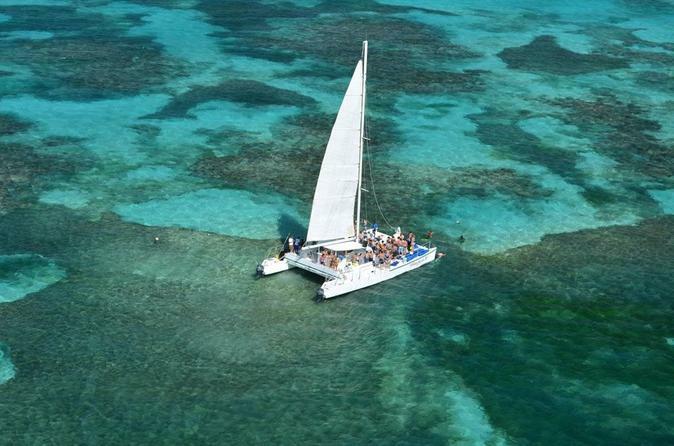 Hop aboard a catamaran for a snorkeling tour to the most beautiful underwater ecosystem of the Dominican Republic. On this full-day, all-inclusive experience to Catalina Island, you'll enjoy clear turquoise waters, a private beach to relax on, and a selection of refreshments at the bar overlooking the ocean. For lunch, a Dominican feast is prepared by a local chef. When booking, you have the option to upgrade to the VIP package to include fresh lobster with lunch. Feel the wind rushing past you as you soar from platform to platform zipping on the 12 different double cables, assuring maximum safety. 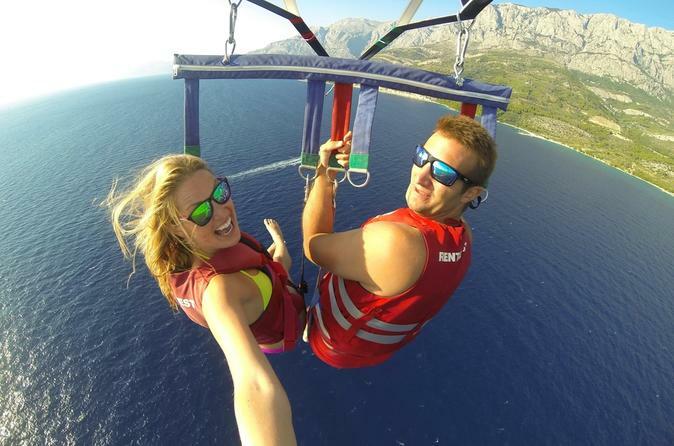 Enjoy with your partner the only Ziplines in Dominican Republic with one side-by-side cable! Set against the lush tropical mountain forests of Punta Cana, we promise you this will be a truly unforgettable experience. 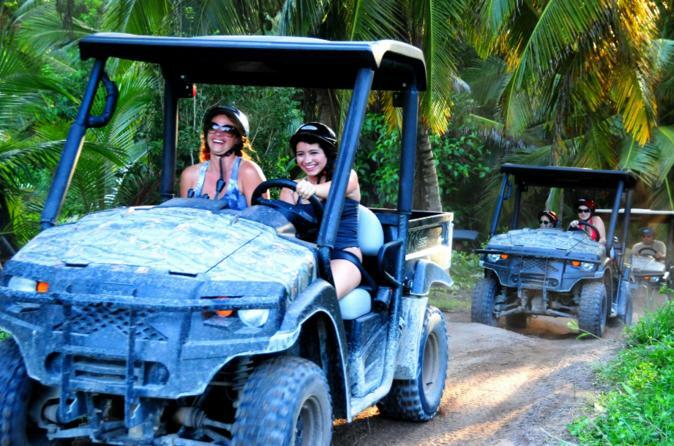 Explore land and sea in Punta Cana by off-road buggy and catamaran—all in one day! With this full-day combo tour, experience the adrenaline rush of driving a Club Car XRT950 vehicle along a jungle path. Stop at Playa Blanca (White Beach) and swim in a crystal-clear lagoon at the Indigenous Eyes Ecological Park. Then, enjoy a smooth catamaran ride over the Caribbean, stopping for more swimming and a delicious seaside lunch. Complimentary rum, beer, soda and snacks as well as hotel pickup and drop-off are included. 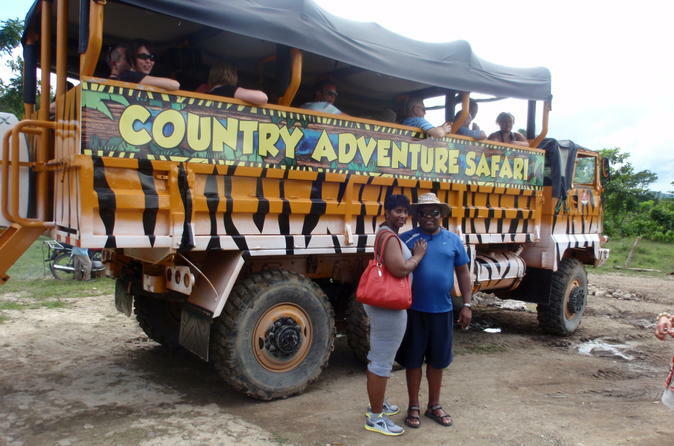 The Flintstones-themed buggy adventure is an unique and exciting excursion, 100% off-road in Bavaro / Punta Cana, Dominican Republic. Visit the unforgettable "Cave of Fantasy" & "Bedrock City". 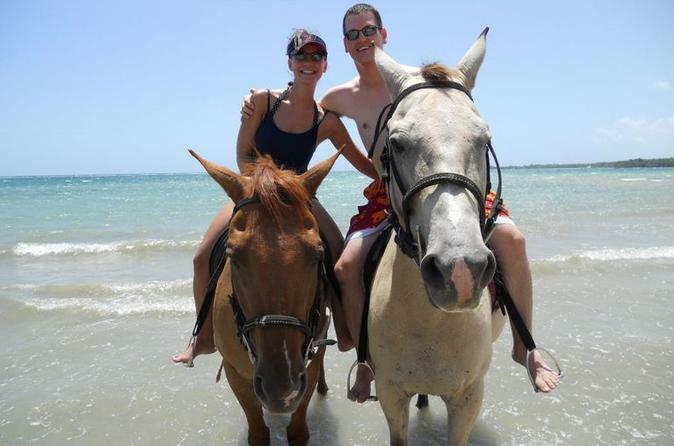 Live the dream of riding a horse along tropical white-sand beaches on this day trip from Punta Cana! Gorgeous scenery, friendly guides and amazing horses make this trip to Rancho Caribeño a day to remember. 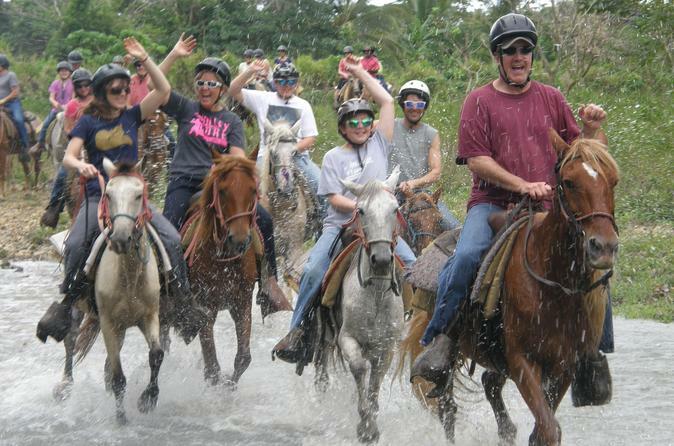 Designed for all ages and all levels of experience, this fun horse-riding adventure is perfect for the whole family! The Farallon Zip Line, in Cap Cana, is unique around the world. Unlike most zip lines, attached to trees, these zip lines are attached to El Farallon Cliff overlooking the Caribbean Sea. Afterwards, visit Hoyo Azul, a natural pool with clear waters fed from an underground river. Your adventure will start at your Punta Cana hotel where you will be picked up by your friendly and professional tour guide that will offer information about Dominican culture and history. The first stop will be at Altos de Chavon, a captivating, man-made village that is a marvel of epic proportions. The second stop will be at Saona Island where you can enjoy the sparsely populated island with white sand beaches and clear turquoise waters. After three hours, head to the natural swimming pool for a relaxing end to the day. Ahoy explorers! This cave and rum factory tour be perfect for families or groups of any size! Purchase beautiful, personalized hand-painted bottles filled with delicious local rum. At the Pirate Rum Factory you will taste 8 famous rum flavors including coconut, coconut punch, coffee, passion fruit, pineapple, banana, lime, and mamajuana. Your guide will also explain the history of the Dominican rum-brewing process. On this tour you will also visit the Taino Caves to experience the thrill of an underground cave millions of years in the making and to learn about the original inhabitants of the Dominican Republic - The Taino Indians. Experience the beauty of the crystal-clear Caribbean above and below the surface on a 3-hour tour that combines three amazing activities in one. Drive a speedboat along the Bavaro-Punta Cana coastline, and then descend to the depths as you SNUBA and snorkel in the turquoise waters. Your tropical undersea adventure takes you snorkeling over the Bavaro coral reef. 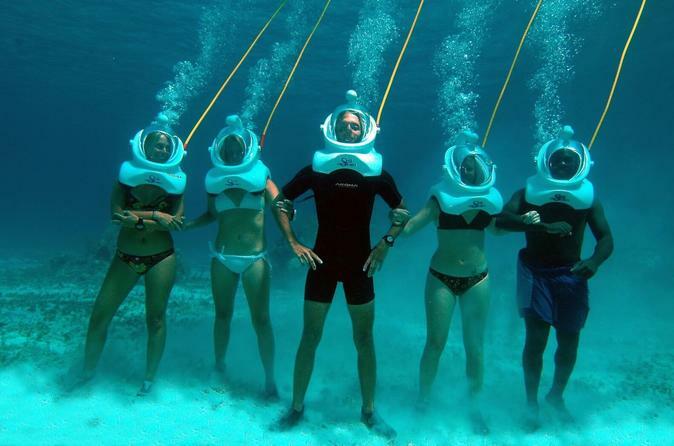 Then, observe marine life up close as you breathe underwater and walk along the sea floor. Hotel pickup and drop-off are included. 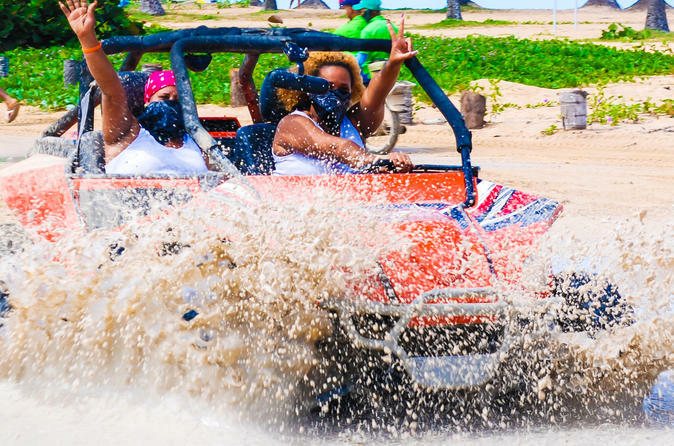 Hop aboard a dune buggy for a full-day adventure and experience the best Punta Cana has to offer! 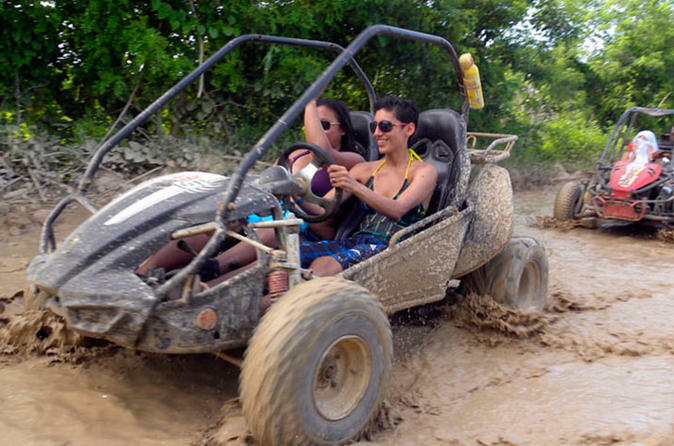 Drive your manual transmission dune buggy through rice fields and along Playa La Vacama. Share your 4-passenger buggy with another party or keep all the driving to yourselves (depending on which option you select). Enjoy refreshments plus lunch at a local restaurant, then heat to the lagoon where you will take a boat cruise through mangroves to a beach. Receive personal attention from your guide on this small-group tour, limited to 12 people. 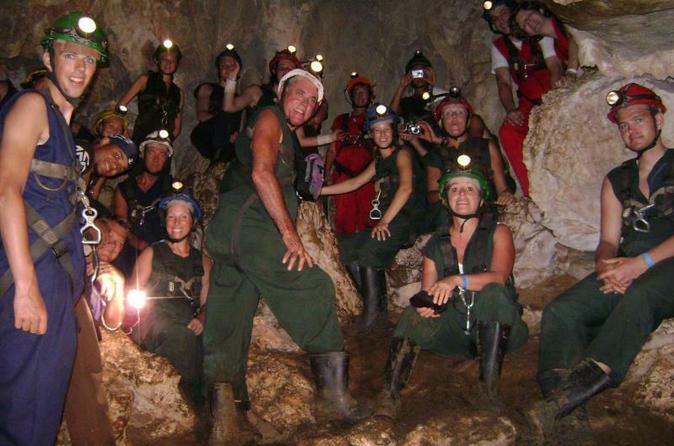 Explore the magnificent underground tunnels of Fun Fun Cave in the Dominican Republic. On this day trip from the Punta Cana area, you'll have the chance to horseback ride through beautiful Los Haitises National Park, repel to the base of Fun Fun Cave and learn about the history of the area. Start the engine of your Macao Buggy and rev it up! You'll be tearing up the Dominican backroads with your tough automatic buggy. Enjoy amazing scenery, muddy paths, a secluded cave and a picturesque beach. 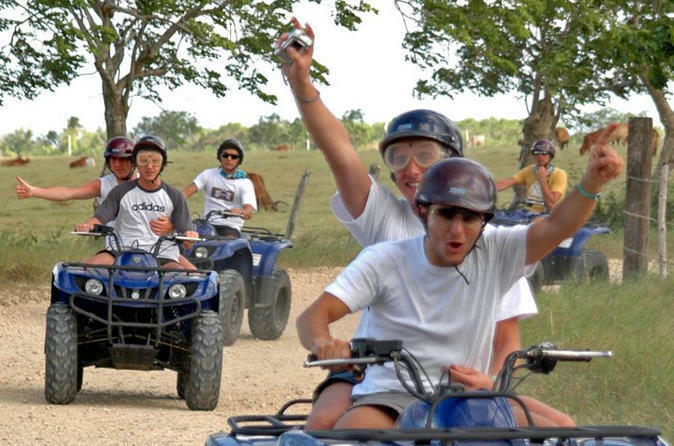 Macao Buggies is sure to be a memorable experience during your stay in Punta Cana. 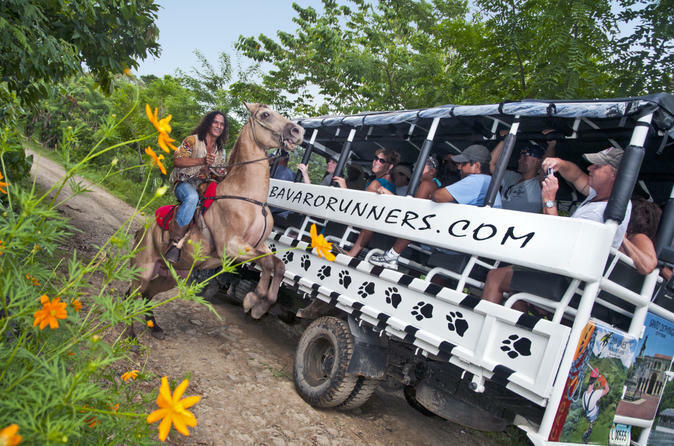 Enjoy a thrilling eco-tour at Cap Cana’s Scape Park, where you can drive a 2-person buggy or combine the buggy tour with a 2-hour zipline adventure option for the ultimate jungle adventure! 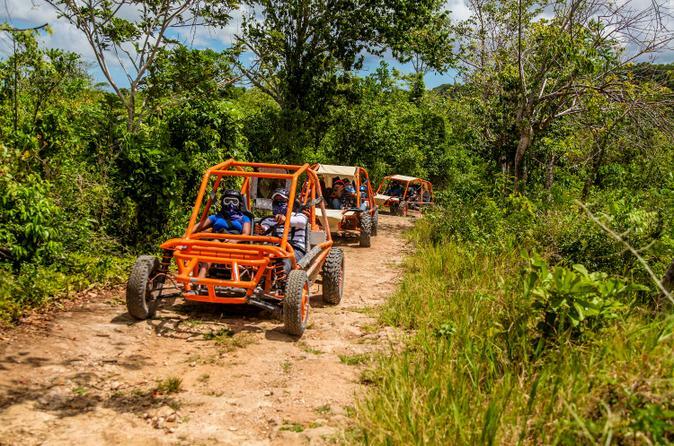 Follow your guide down back roads on your ATV beach buggy, with a pitstop a a beach to enjoy the beautiful Caribbean scenery, and soar through the canopy on eight ziplines and climb a suspension bridge. If you opt for a combo tour, you’ll have six hours to spend, including lunch. Choose from morning or afternoon departure times. 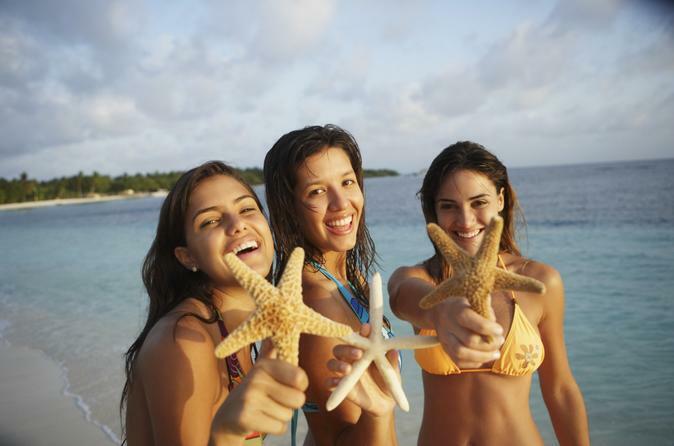 Isla Saona is currently the most popular excursion offered in the Dominican Republic. The island is the quintessential tropical beach with swaying palm trees, bone white sand and lapping turquoise waters. On this cruise you will enjoy an open bar along with a delicious buffet lunch on the island. With the sound of the waves gently lapping the shore, embark on a world-class catamaran cruise in Punta Cana. Enjoy this great party, snacks and tropical fruit, open bar with national drinks and beer of various kinds. In addition, a DJ will play music of your choice and a great crew will keep you entertained. 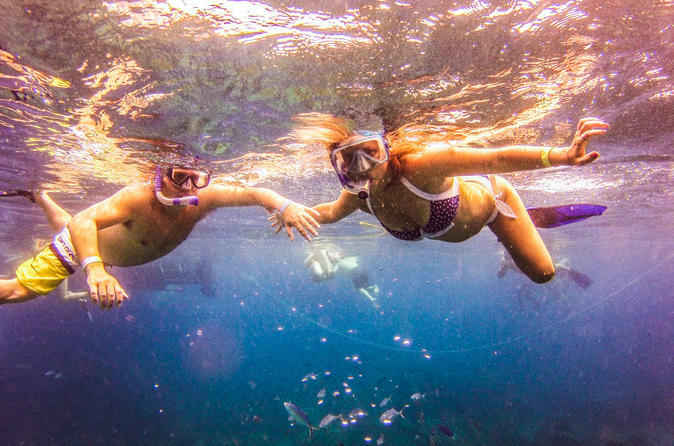 Practice snorkeling among multicolored fish and incredible coral reefs. Enjoy a dip in the refreshing natural pool of Bavaro. Listen to great music, play games, and much more. Enjoy a peaceful, countryside horse ranch in northern Punta Cana where you can enjoy a fun-filled time of horseback riding away from your resort. Professional guides will assess each visitor’s horseback riding experience and provide instructions about riding and controlling your horse. 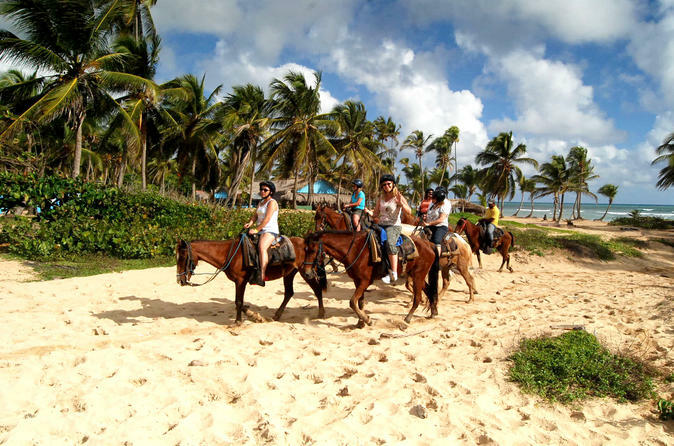 Your guides will accompany throughout the tour where you gallop, or stroll, along the beautiful Uvero Alto Beach. This beach is one of Punta Cana’s most sought after coastlines, far from the resorts and barely touched. After the tour is over you will receive a Local Rum bottle per booking with your photo on it as a memorable souvenir. 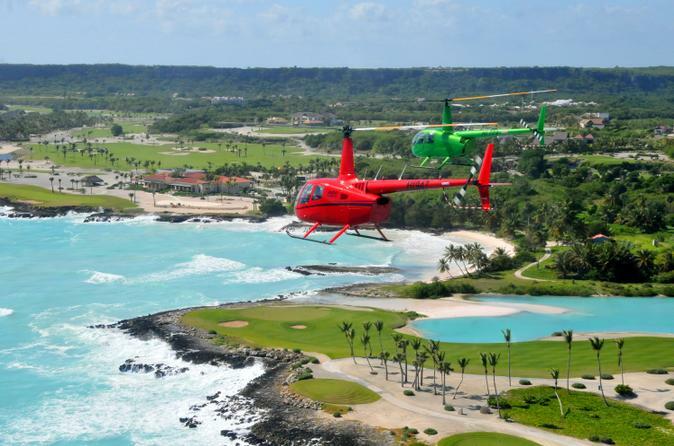 Enjoy an exciting helicopter tour from Punta Cana over the Dominican Republic’s southeastern beaches. As you soar through the air above this piece of tropical paradise — where the Caribbean Sea meets the Atlantic Ocean — gaze down on the white sand, turquoise water, bright green palm trees and sprawling resorts. 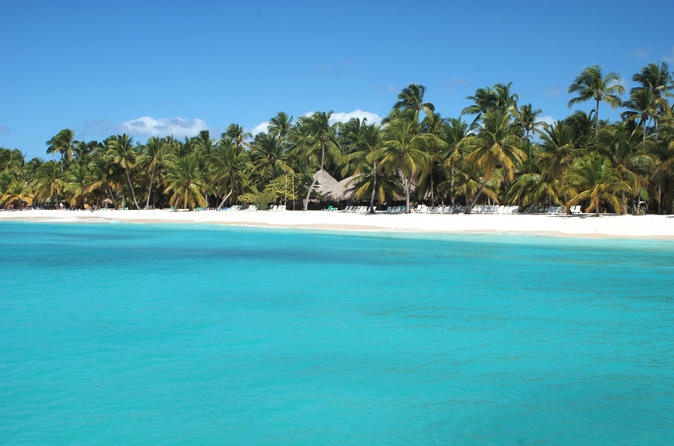 Depending on the option selected, you’ll see Bavaro Beach, Bavaro Lagoon, Macao Beach and Uvero Alto Beach. Choose a tour from 10 to 40 minutes. 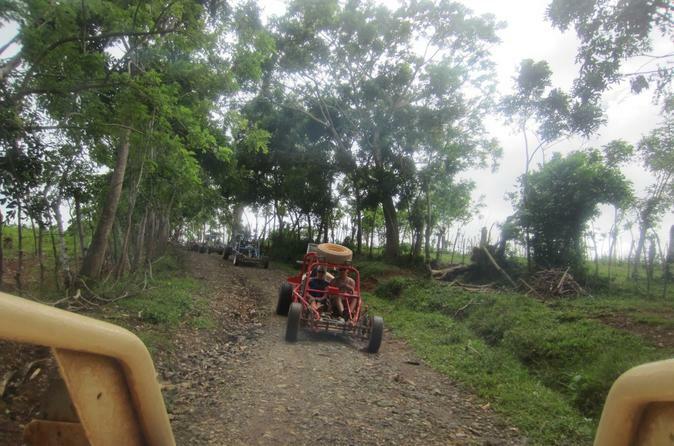 On this exciting excursion in Bavaro - Punta Cana, Dominican Republic, explore the beautiful island on a buggy! This is the perfect adventure for the whole family and each buggy can accommodate up to 5 persons. All necessary equipment and hotel transportation is included. 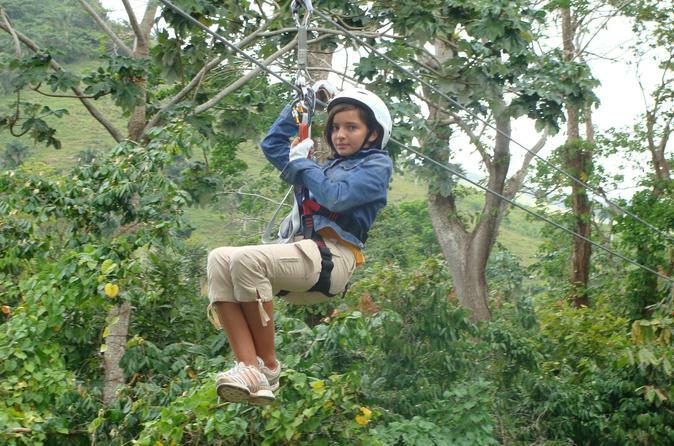 Fly through the treetop canopy at Scape Park, an eco-adventure park located in the luxurious Cap Cana Resort. In two hours, with the help of professional guides, zoom along on a nine-zipline circuit with platforms set in Farallon Cliff. Take in amazing views of the Caribbean and the lush green scenery of the resort grounds. 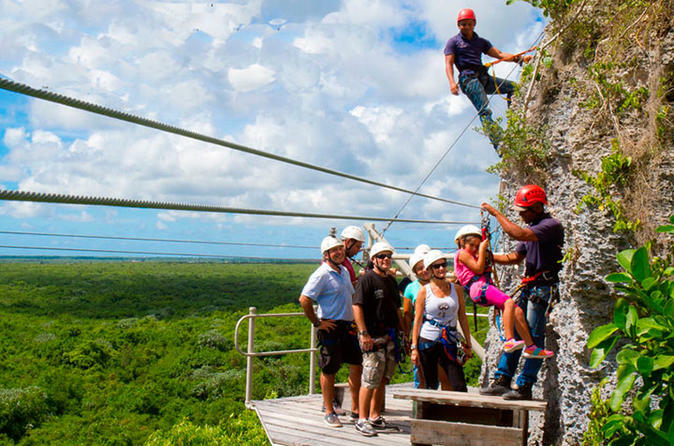 To add even more excitement, your aerial adventure boasts a suspension bridge, cave and ecological nature trails. Hotel transport is included in this family-friendly tour. Jacques Costeau eat your heart out! Walk along the ocean floor and discover the amazing corals and tropical fish of the Caribbean. 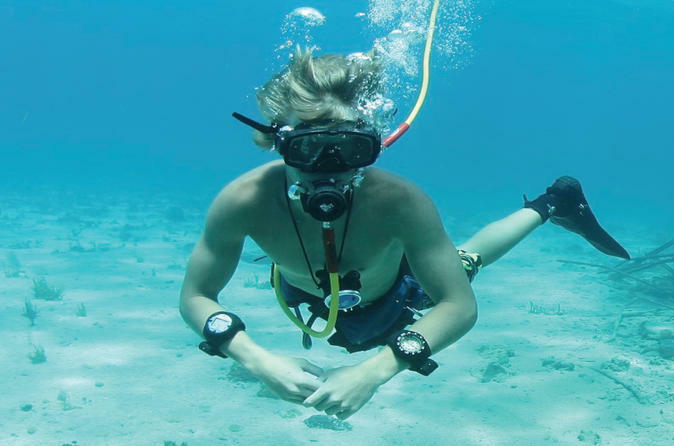 This is the easiest way to explore the underwater world, its as simple as walking and breathing. 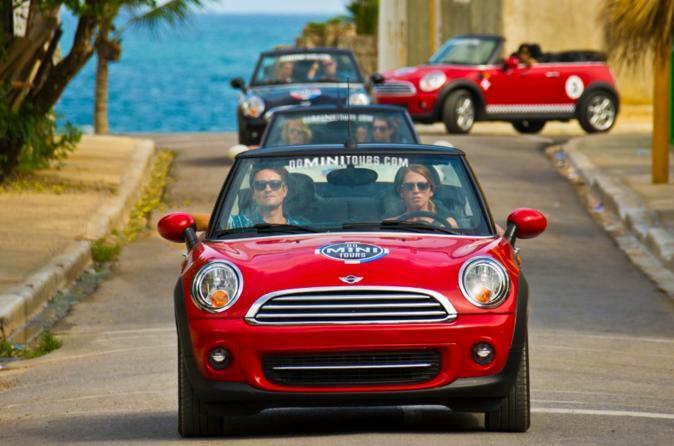 Have you ever dreamed of driving a Mini Cooper convertible? Take the wheel of your own 4-person classic car and put the top down during a full-day tour from Punta Cana! You’ll cruise in style along country roads, feeling the breeze on your face and stopping at local attractions with your guide. During the tour, pass by Casa de Campo, stop at Altos de Chavón and the Regional Museum of Archaeology, and visit a cigar factory. On this half-day 4x4 ATV adventure you will leave the resort area behind to explore some picturesque spots throughout Macao Beach. Start a quest to the true side of Dominican life with this Punta Cana tour to Macao Beach that is guaranteed to leave you amazed! You will head out into the rural areas and onto the lush tropical trails of the area nearby the Oriental Mountain System. You will also see how banana, coffee and cocoa are grown, harvested and produced by locals. Come, relax and enjoy these breathtaking attractions on an unforgettable 3-hour adventure in Punta Cana. 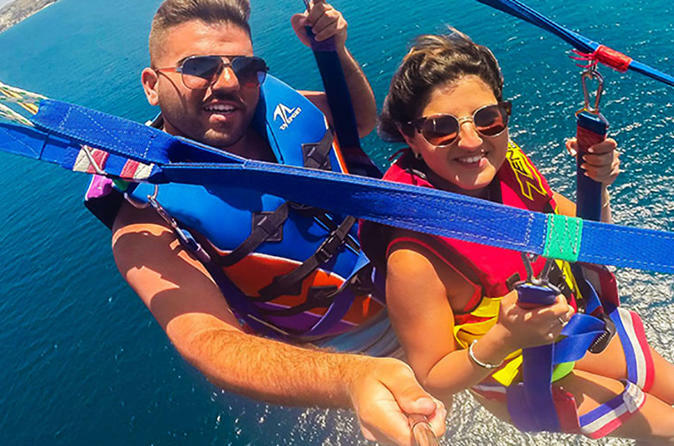 While parasailing, observe from 500 feet in the air the beauty of the Caribbean seafloor and appreciate a spectacular view of the coast Cortesito-Bavaro. Immerse yourself in a small island in the middle of the ocean, inhabited by amazing gentle giants: harmless nurse sharks and stingrays, where you can experience the thrill of swimming, touching and stroking their soft skin. 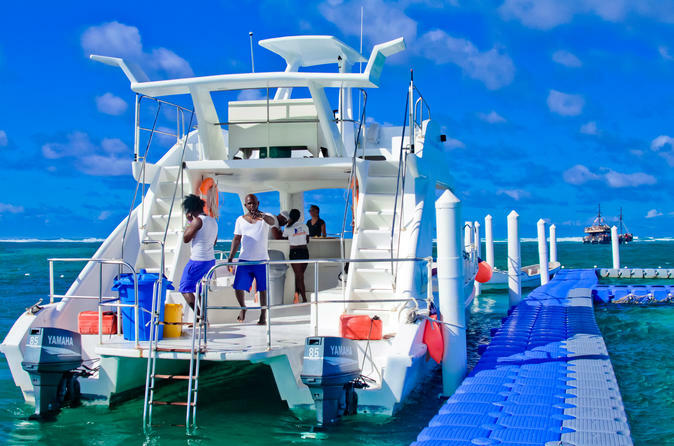 Spend an unforgettable day on the water during this private 4-hour Snorkel and Catamaran adventure from Punta Cana. A great option to unveil the true beauty of Punta Cana while you sail the coast from the luxury of your own private Catamaran. Sip drinks while playing music of your choice (courtesy of a usb port for your android or i-phone), play games or just simply relax and relish the experience. Snorkel and submerse yourself in an underwater world full of precious corals and schools of countless tropical fish. Spend a wonderful time with friends and family in the awesome natural pool while you down tropical cocktails off the floating open bar. A great bartender, a wonderful crew and professional divers will ensure your safety and entertainment at all times. Speed up your engine and enjoy a front seat view of the Carribean's most spectacular sights and views. Bump through the Dominican Republic's lush landscape in a powerfull 4x4 off-road buggy during this 5-hour eco-adventure from Punta Cana. 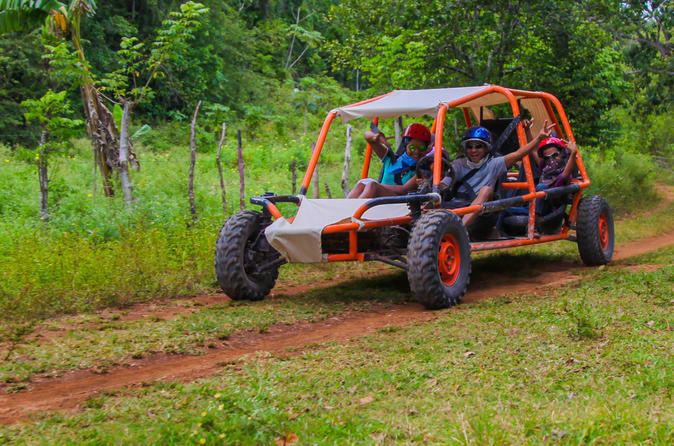 With oversight from your local guide, drive your buggy through the forest to reach an organic farm, stopping to taste the rich flavor of organic dominican chocolate, coffee and rum. 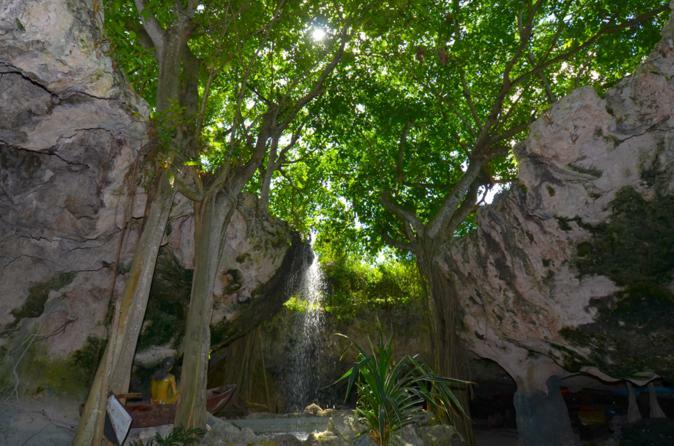 Continue to the Taino Ecological Park,"Adventure Cave" for a dip in a freshwater cenote. 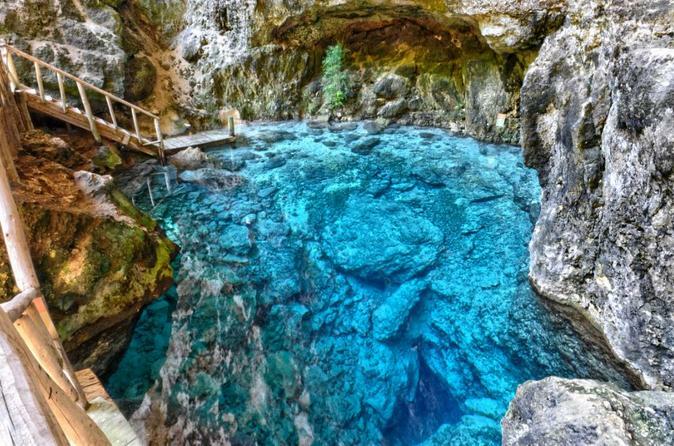 Just imagine the natural beauty of an underground cave filled with the freshest natural spring water ever seen and then imagine taking a dip in it! Then head for Macao Beach to relax and enjoy the sand and waves. Round-trip transportation from Punta Cana hotels is included. Get to know the Dominican countryside aboard a safari-style vehicle on this guided day trip from Punta Cana. Up in the Anamuya mountains, visit an old sugar plantation to see different methods of harvesting sugar and watch a cigar-rolling demo by artisans who’ve been in the business for years. Visit and relax on a private beach club at the stunning Macao Beach. A horseback ride, mountaintop buffet lunch and a visit to a Dominican home to meet a local family are all part of this off-the-beaten-track tour. 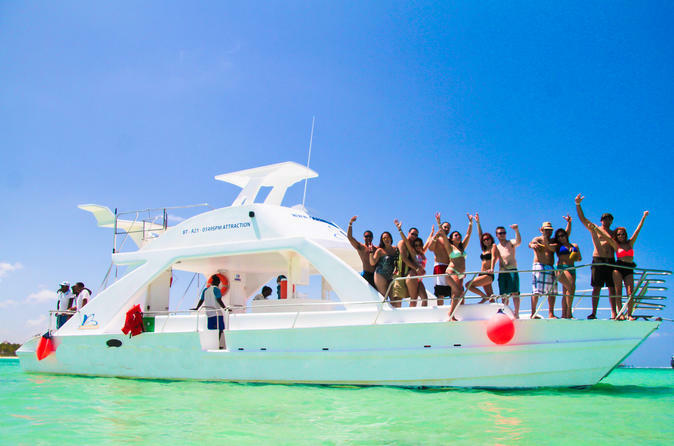 This half-day party cruise combines several adventures including snorkeling, hooka diving and parasailing. Live an unforgettable experience for the day as you discover the sky and sea to the fullest with this excursion where you can meet the coast in a unique way whether you are snorkeling, diving, parasailing or enjoying a party on the catamaran! At Scape Park you can build your own value combo from the amazing excursions available! Choose any of your two favorite attractions and save.